I’ve wanted to travel for as long as I can remember but I haven’t yet been able to do it on my own. One of my goals for this year is to “take an epic trip for myself” (which to me means travel abroad on my own) and to take 3 smaller trips or days out with friends. So far, I’ve just taken one smaller trip with my friends to Cape Cod, and I’m in the process of planning a couple more upcoming adventures. 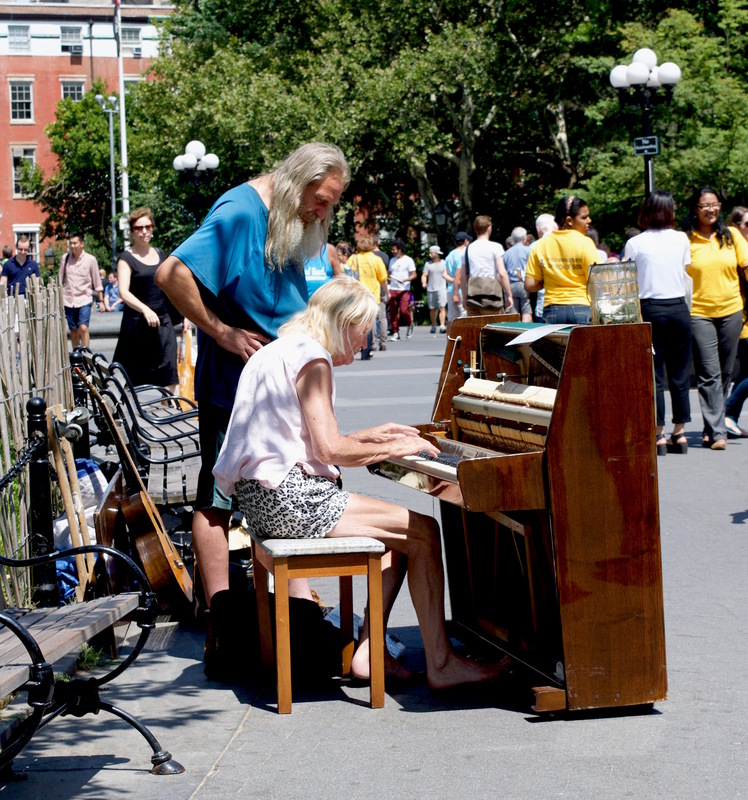 So what does this have to do with Washington Square Park? Well, in thinking about all these trips, the travel bug has hit me. I can’t quite jet off whenever I wish, so I’ve been looking for places in my own city to explore more thoroughly. 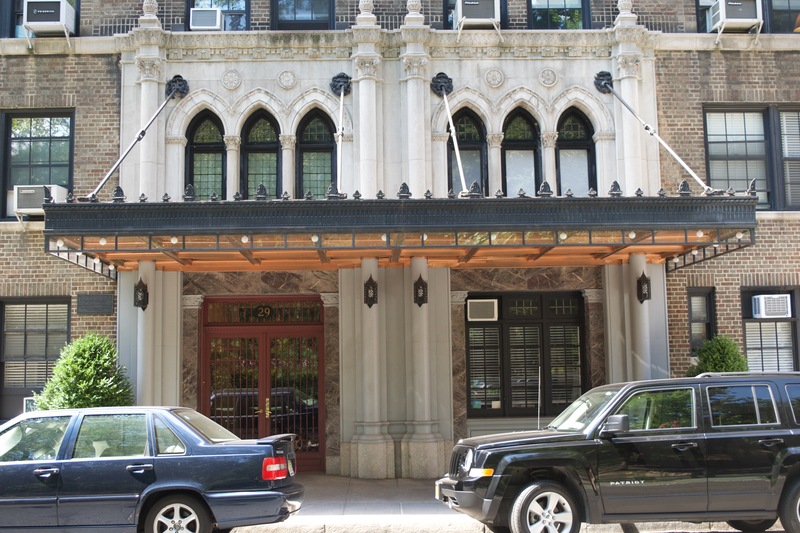 I’ve done a bit of that this summer, exploring the sweetshops on the Upper East Side with Sorted Food, but I wanted to go beyond eateries. 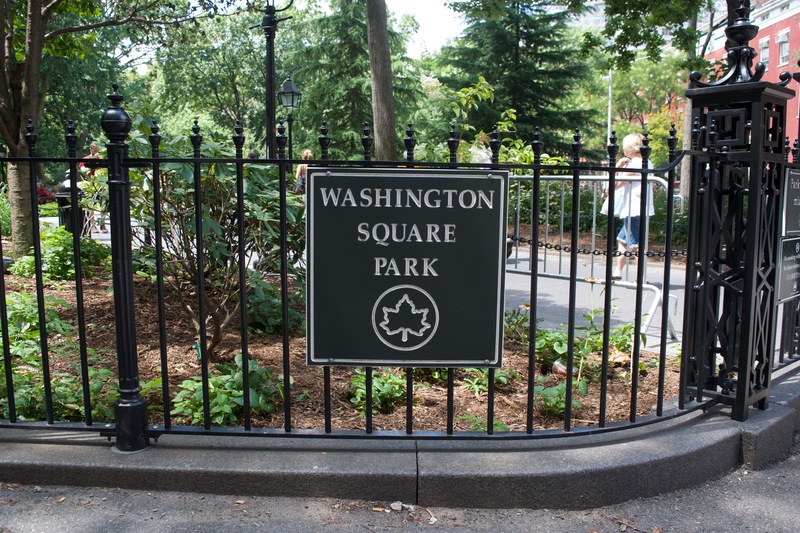 My friend Radhika suggested Washington Sq. Park. I was skeptical because I’d been there before, and while it’s pretty, I didn’t think there would be much I could say about it. However, last Sunday I took her advice, and found that it’s a treasure trove of interesting characters. As I mentioned, the park is beautiful. 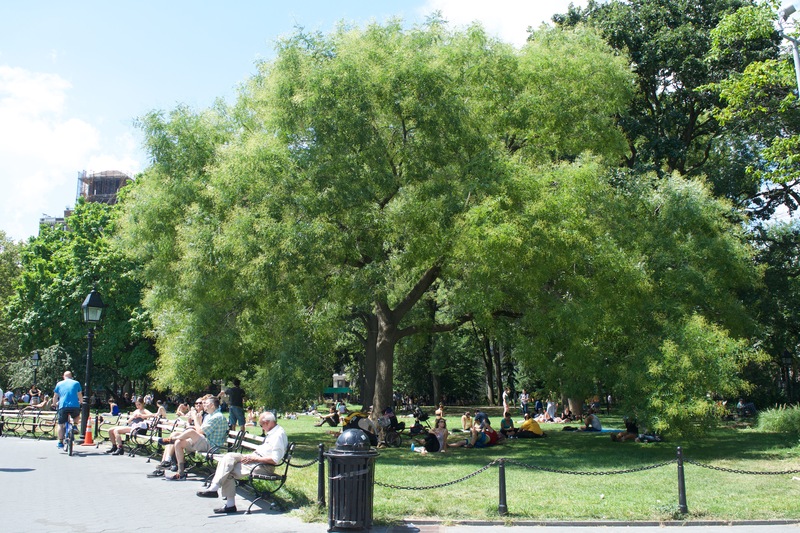 It has plenty of green spaces for people to hang out in the shade or the sunshine. 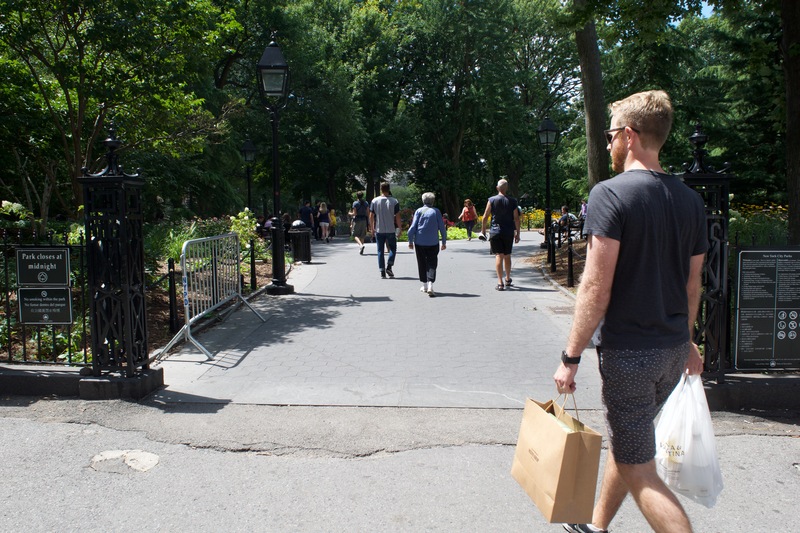 It’s a throughway for a lot of foot traffic with the West Village and Union Square within walking distance. 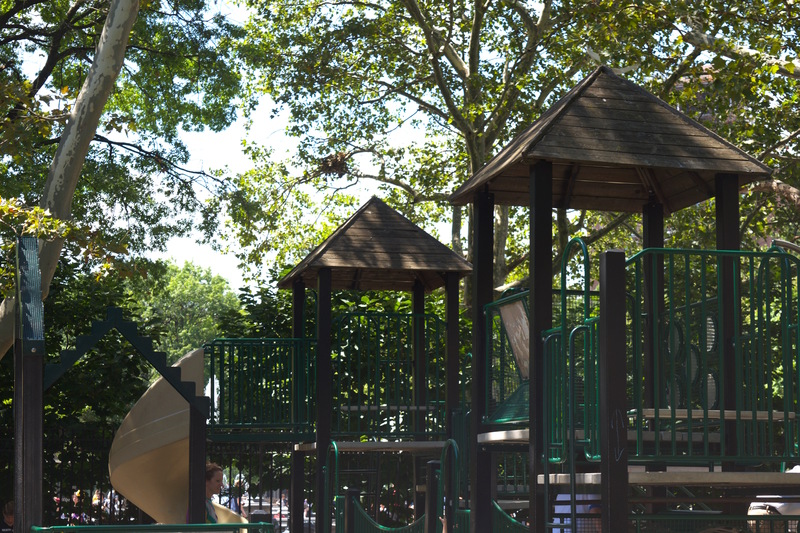 The park is well-sculpted and made up of a variety of smaller, interesting areas. Walking through the park makes for a lovely commute on a sunny day. 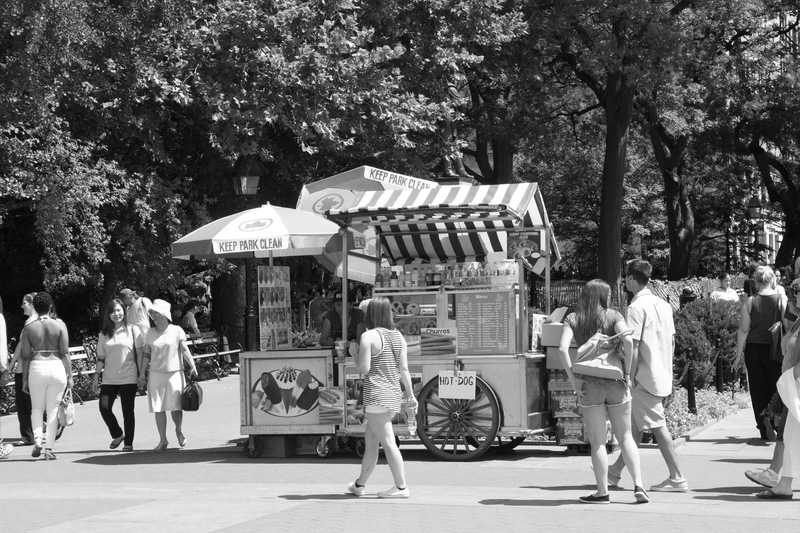 Another classic scene – the hot dog and soda cart. There were surprisingly few of these in the park… others stationed themselves just outside on the sidewalks. Gorgeous yellow flowers greet you at one entrance. If you look closely, you can see a couple friends chatting just behind them. One of my favorite things about the park is the beautiful trees. There are all different kinds – strong oaks and maples, mulberries, a huge sycamore, and something graceful and sweeping that I think might be a willow. (Help me out, nature-lovers!) Radhika mentioned to me that cherry blossoms bloom there in the Spring – I definitely want to come see those next year. 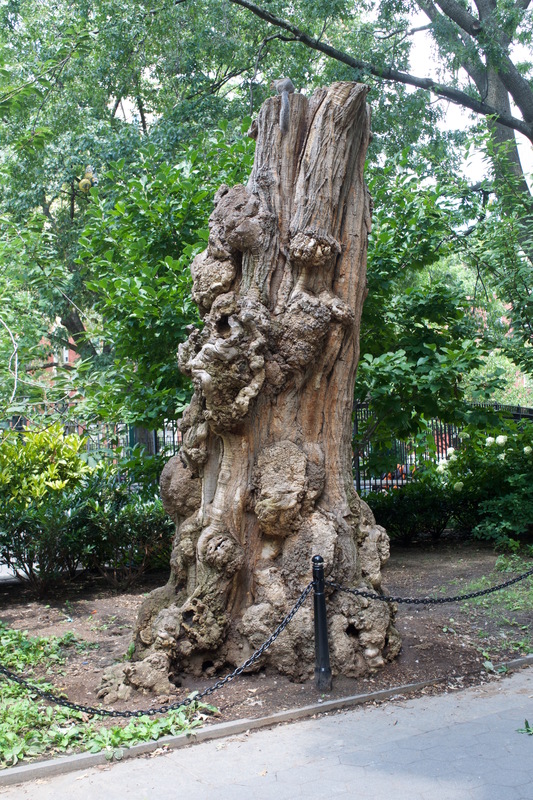 This knotty old tree stump seems to be a mini-tourist attraction within the park. I found myself looking at all its lumps and bumps for several minutes. 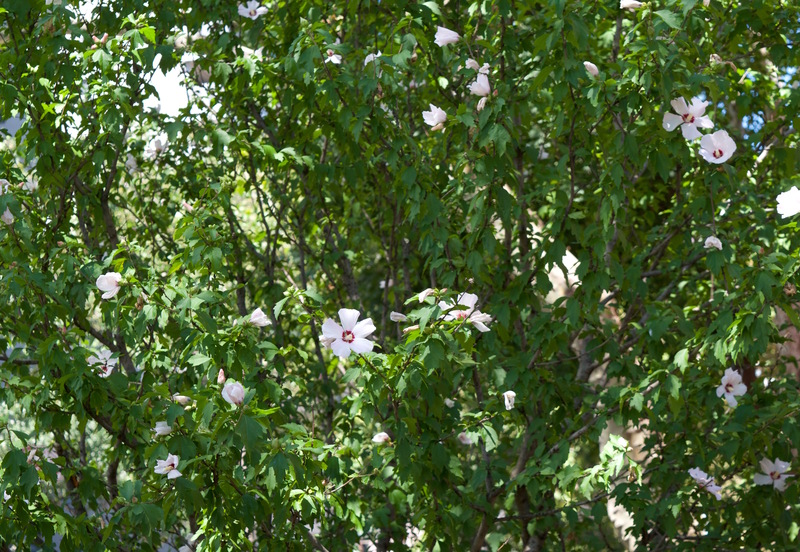 I loved that there were still flowers in bloom all around the park. A variety of trees make a rippling pattern of green wherever you look. You can nearly forget you’re in a huge city! This picture reminded me of a scene you might find in Disney world – there’s a touch of magic and a touch of romanticism, don’t you think? 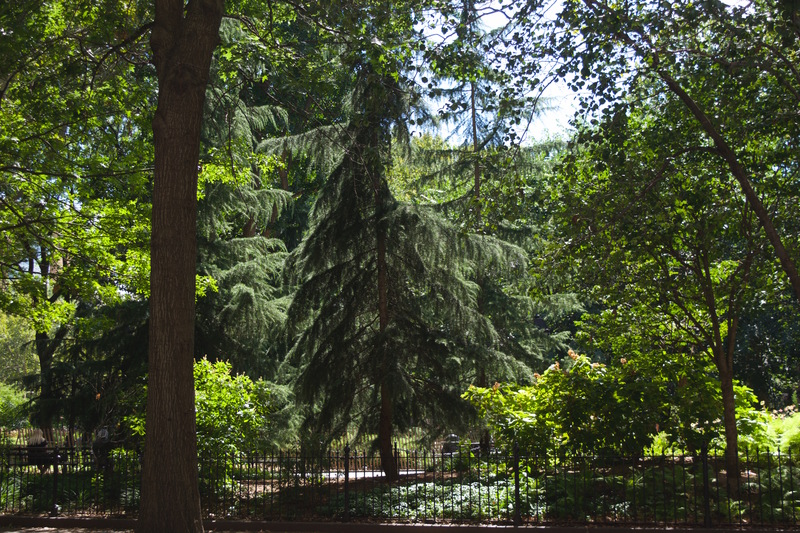 This was my favorite – a lovely sweeping tree that provided the perfect amount of shade. Does anyone know what kind it is? Amidst all this beauty, was a melting pot of people enjoying the sunshine. The park is layer after layer of subcultures, jarringly juxtaposed, but somehow fitting together, very much like the bizarre jigsaw puzzle that is New York City itself. Framing the park is the stately architecture. The most iconic piece is, of course, the grand archway. However, there is also a stunning fountain just in front of it, and several statues peppered along the walkways. 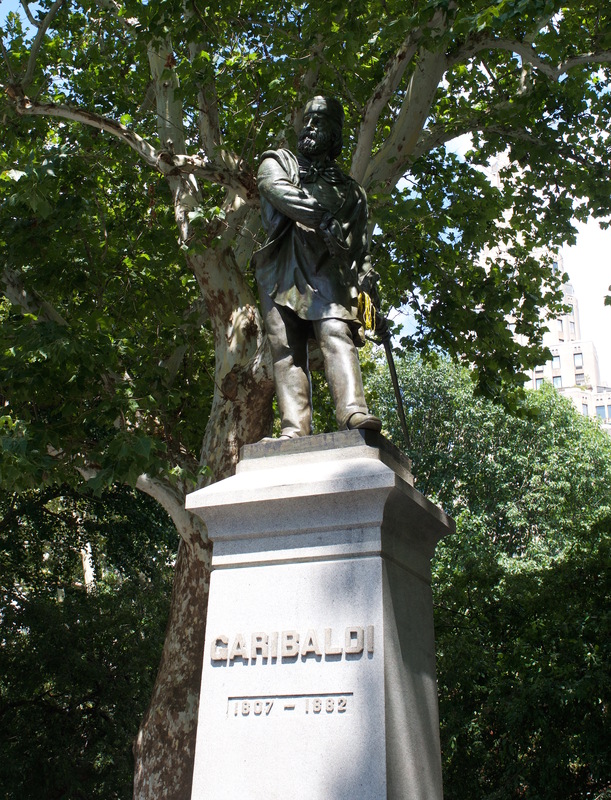 A tribute to Giuseppe Garibaldi, who fought for a unified Italy in the 1800s. Some research tells me that there is an NYU finance new students’ tradition of tossing a penny at the base of the statue for good luck. 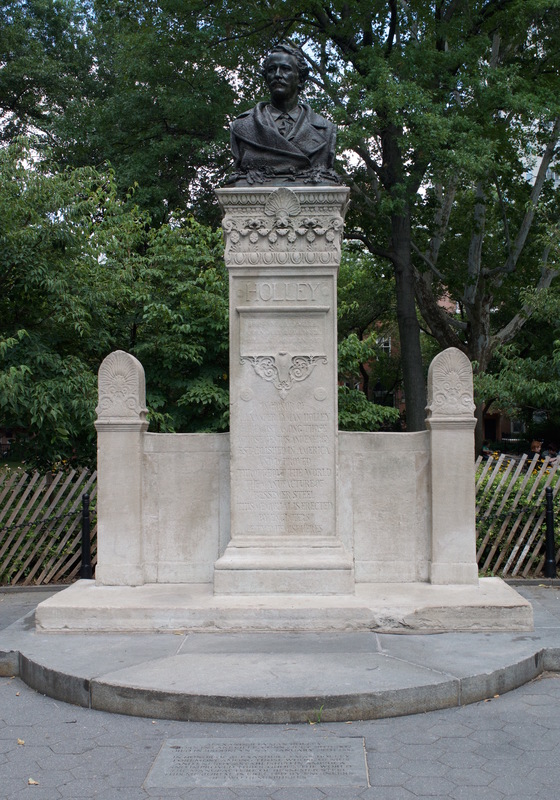 A statue of Alexander Lyman Holley who was a 19th century engineer best known for propagating the use of Bessemer steel in the US and abroad. One of the many odd juxtapositions of the park: a stately archway in the background and people cooling off barefoot by the fountain. 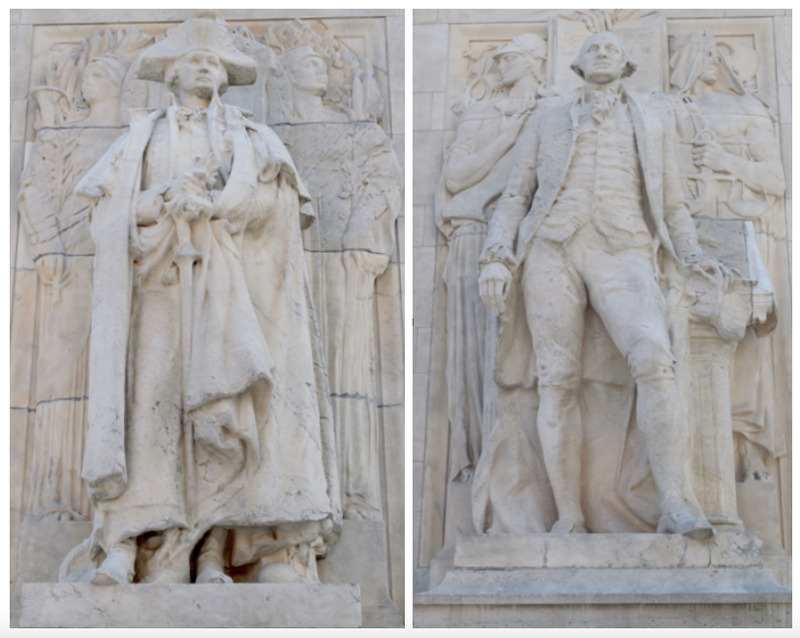 The back of the arch has two statues of George Washington, called “Washington at War” and “Washington at Peace”. The powerful Freedom Tower can be seen through a space in the buildings if you stand just next to the archway. The park isn’t that large, so at any point you could hear two or three musical acts floating through the air towards you. They ranged from dignified classical musicians to college-aged bands to people whose story it was impossible to guess at when you looked at them. I heard this drummer rat-a-tat out a march, fittingly just as I was looking at the statues of George Washington on the arch! 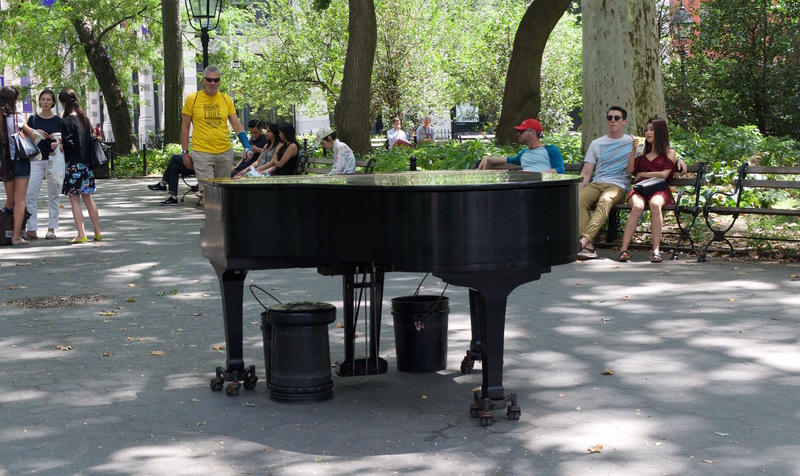 Someone managed to bring this grand piano into the middle of the park. A couple violinists stood chatting in the background, so they may have just finished their set. Some days there is famously another grand piano that is played under the iconic archway. 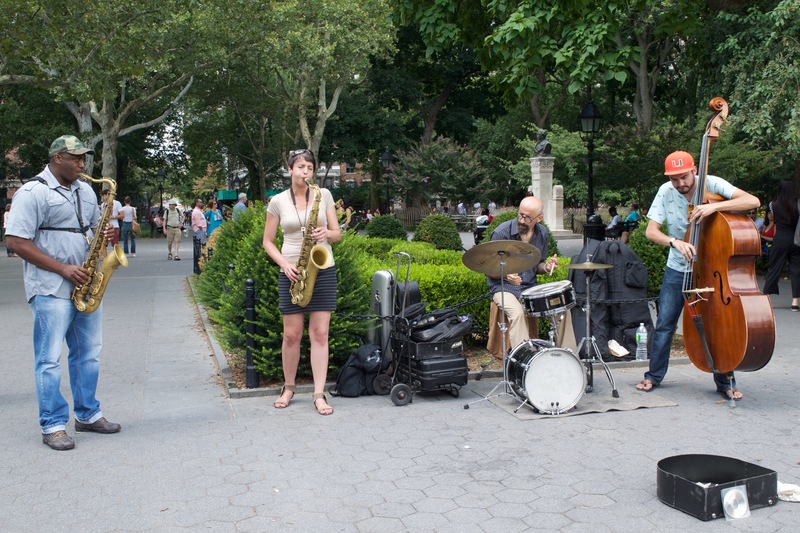 This four-piece band attracted the attention of many passerby. The piano had a printed sign on the front that said “Five ex-wives and piano teacher to support”. I wonder what the stories are there! 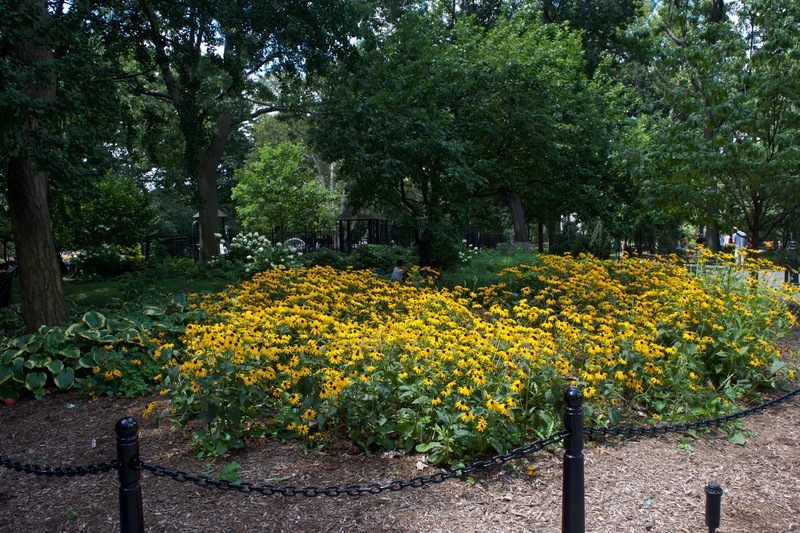 The park is also used for modern-day political and social activism. On the day I was there, Christian volunteers in bright yellow shirts were asking people for blood donations (you can see them in several of the pictures). Joggers tried to avoid (or in some cases, purposely didn’t) running across chalk drawings in support of presidential candidates. Because of the beauty and grandeur of the park, there was an air of natural rebellion or amplification to each of these statements. Someone incredibly talented (Hani Shihada) drew this picture of Hillary Clinton as Rosie the Riveter. Go check out his stuff on Instagram by clicking on this picture – he has some incredible pavement art. Next to Mr. Shihada’s work was this slightly trampled chalk-poster for Bernie Sanders. There were a couple of them in the park. 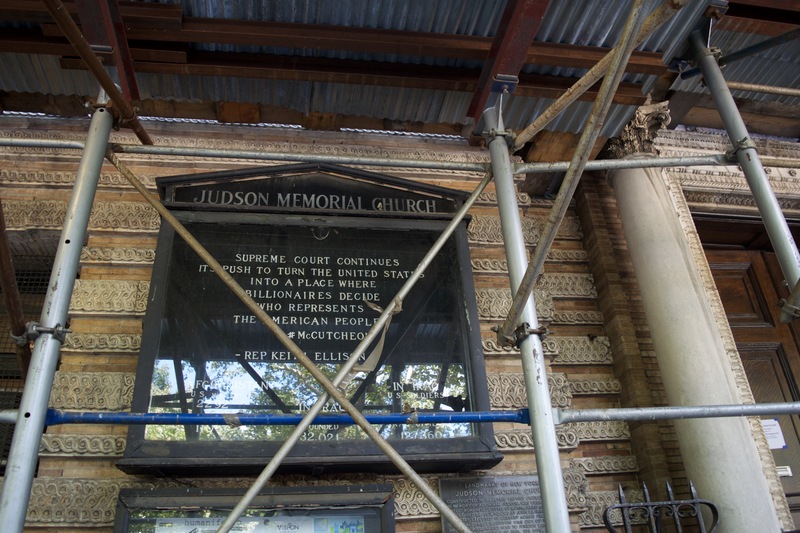 A web of scaffolding didn’t stop this nearby church from adamantly proclaiming its message. 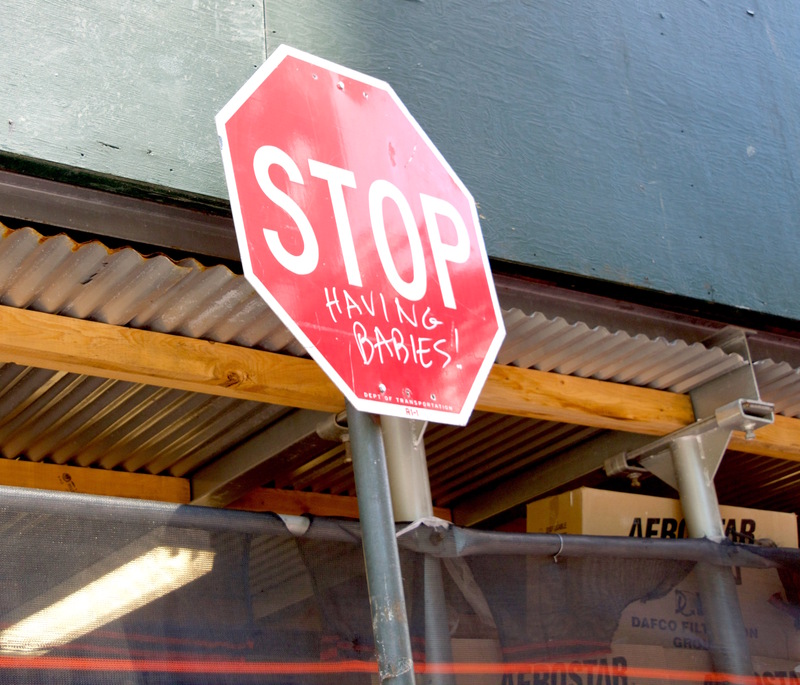 Not sure who the intended audience was here, but I suppose the message is pretty clear…! 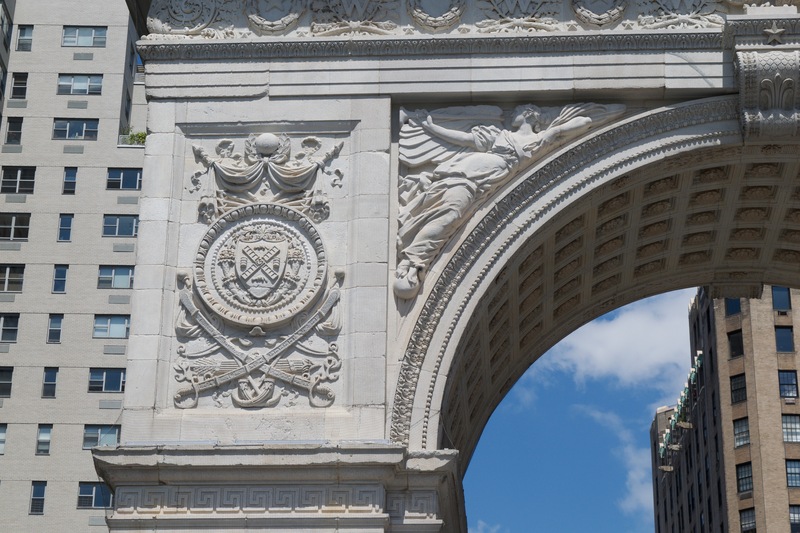 Washington Square Park doubles as a sort of academic quad for New York University. 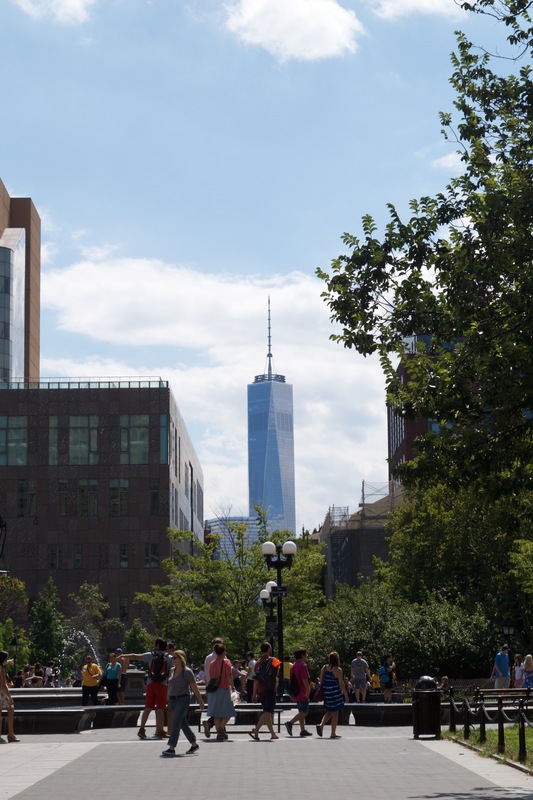 NYU buildings surround the four sides of the park, including one block that is mostly taken up by Bobst Library. 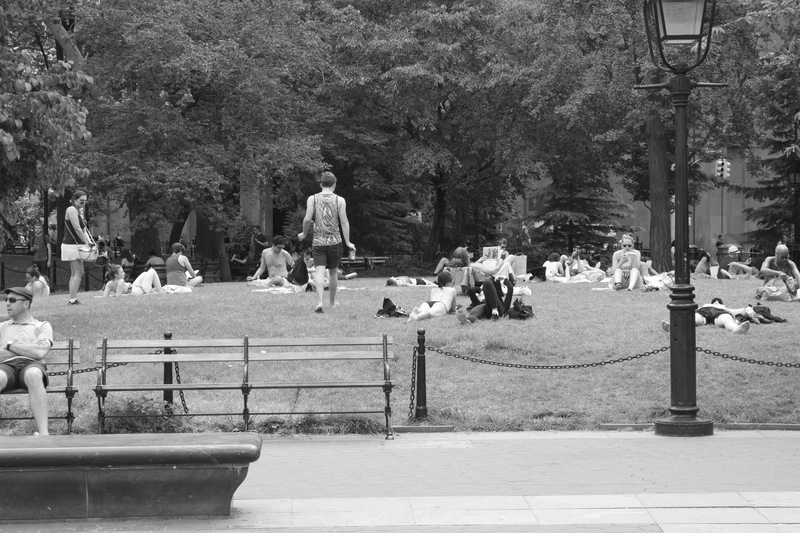 Washington Square Park doubles as an academic quad for NYU students. 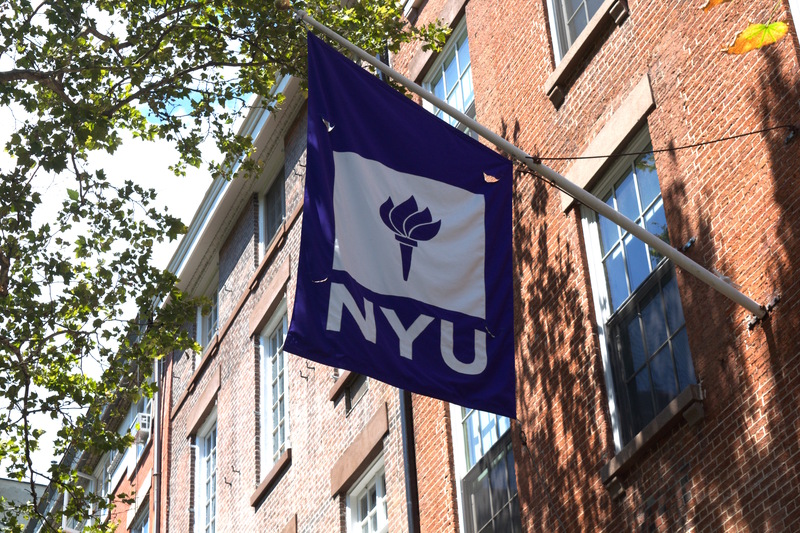 The entrance to NYU’s prestigious law school. A quote on the building reads, “To what purpose should our thoughts be directed to various kinds of knowledge, unless room be afforded for putting it in practice, so that public advantage may be the result.” (Sir Philip Sidney) An interesting though on the idea of knowledge for knowledge’s sake. Ironically, just outside the library was a wizened old man selling books that looked just as old. He freaked out a bit when he thought I took his picture. (To be honest, I did, but when he got upset, I deleted it.) He wasn’t the only whimsical character in the park that day, though. 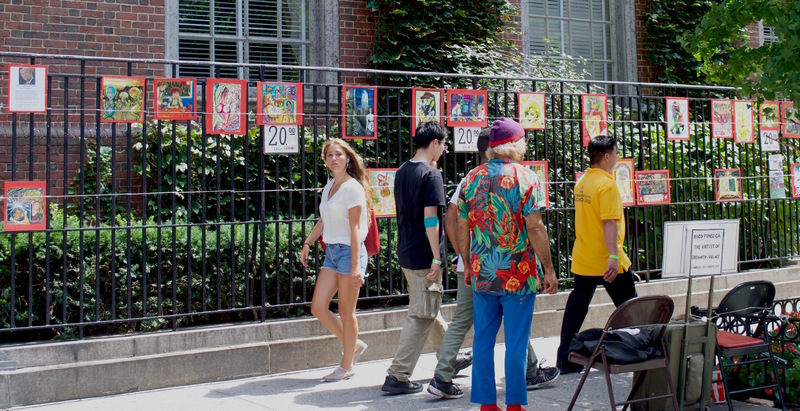 A man in a flower shirt and hat that reminded me of Dopey the Dwarf sold paintings on a nearby sidewalk. 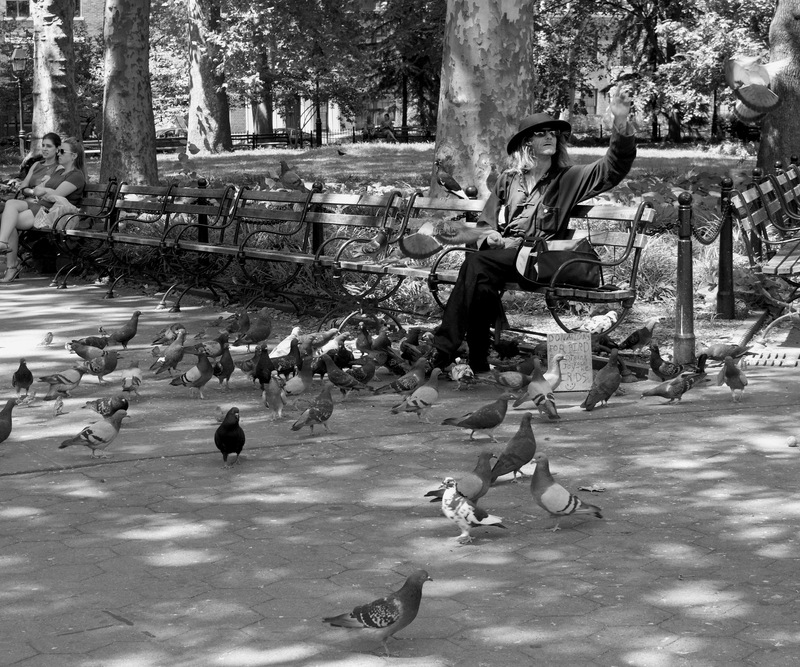 A fellow photographer checks out a man selling instant poetry for $10. 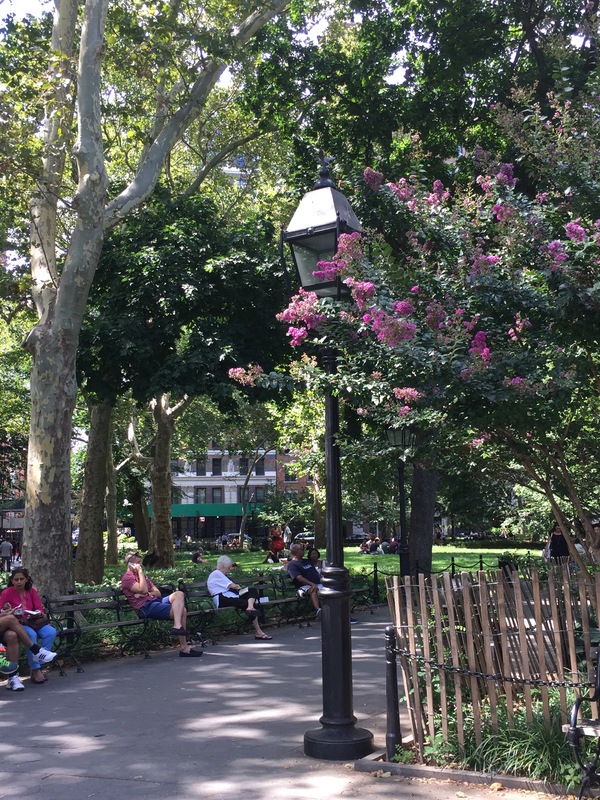 Thanks to NYU, the streets that border the park are beautiful and interesting as well. 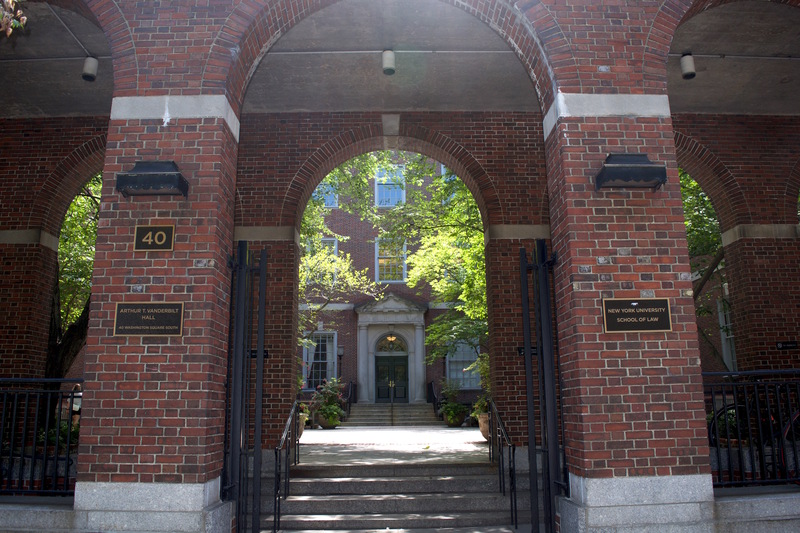 It’s a quick and fascinating walk to go around just looking at the doors on all of the buildings. 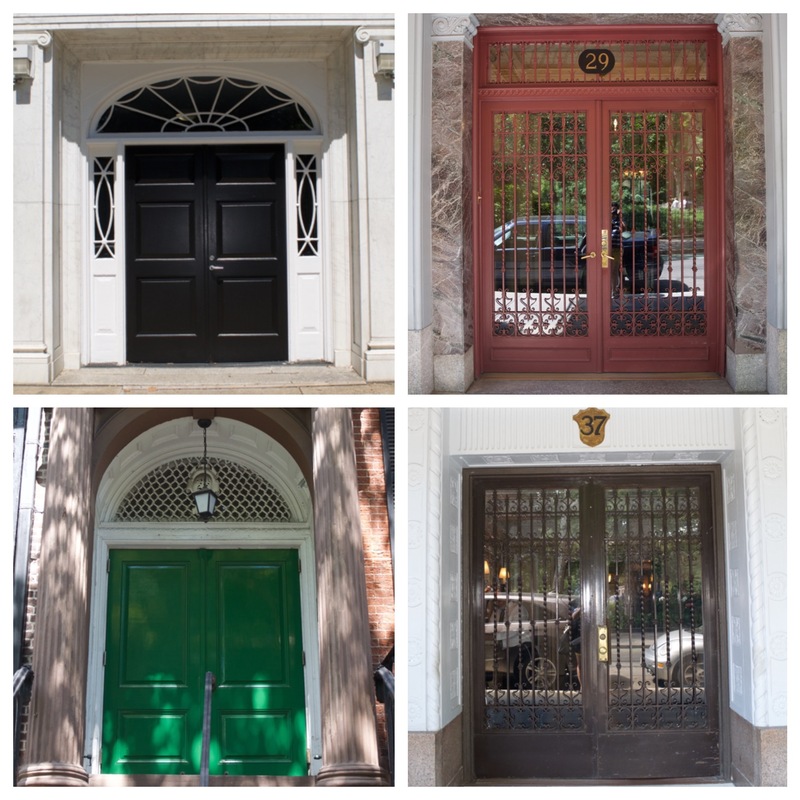 My favorite doors. 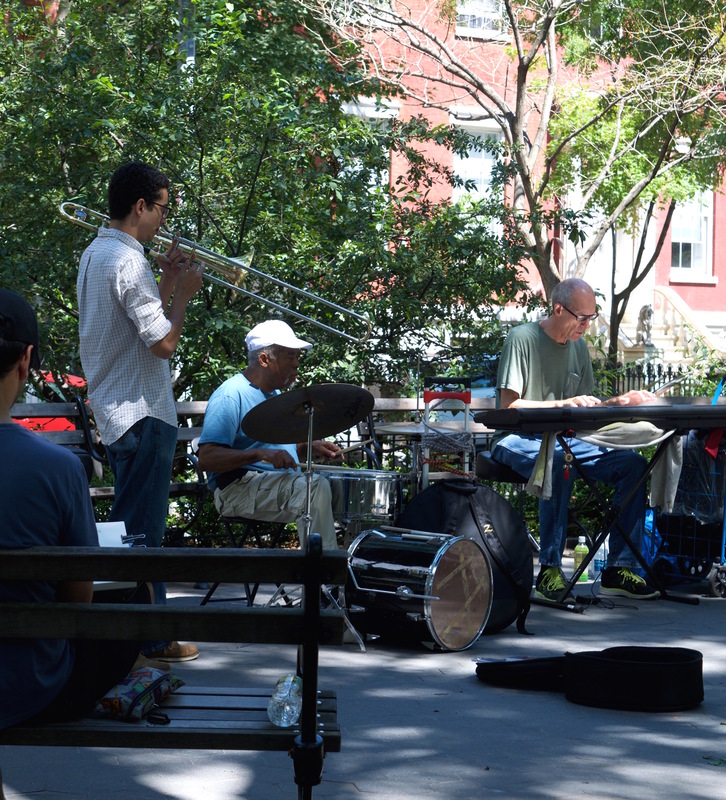 Walking around this area and through the West Village can really make you dream of a grand life. This was Eleanor Roosevelt’s residence from 1942 to 1949. Finally, my favorite part of any park is seeing the little children playing. This is especially true in New York, where there is limited space for running around. Once again, though, NYC remains true to form, creating a little oasis within the metropolis, just like with its street fairs. I love that within this small park, the city has created a few different play areas geared towards kids. 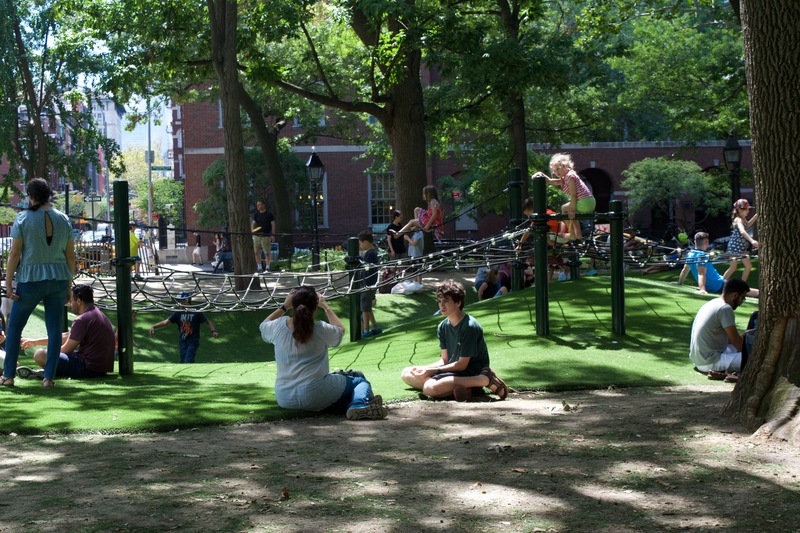 A classic playground structure – the jungle gym. 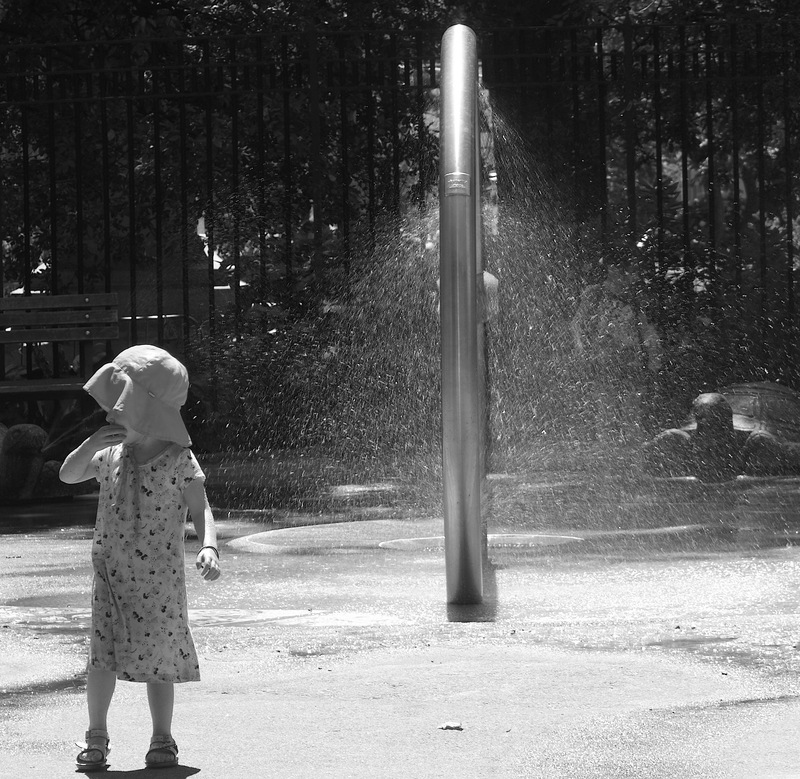 A little girl contemplates running through the sprinkler alone. Thus concludes my Washington Square Park adventure! 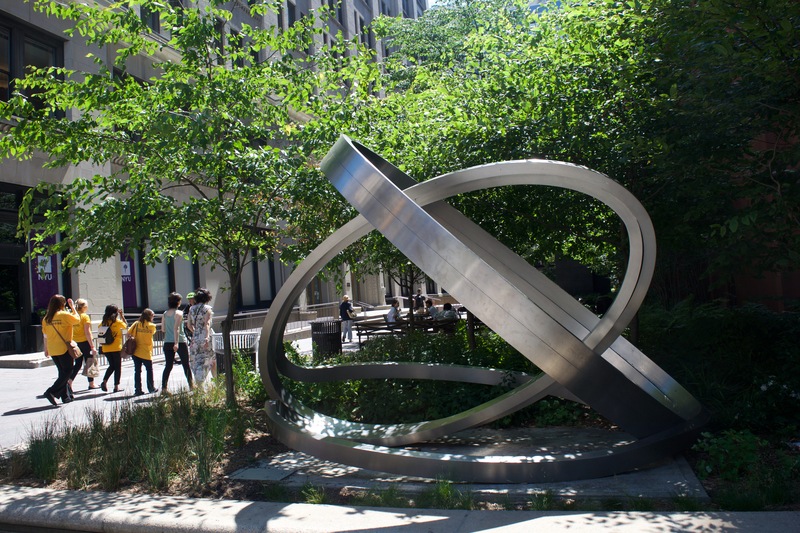 NYC people – have you explored this park? What other areas of the city do you love to visit? Let me know where I should go next! Everyone – have you ever tried being a “tourist” in your own city? What was the experience like? Let me know in a comment!